Almanii B&B is within close proximity and has direct access to the above attractions. 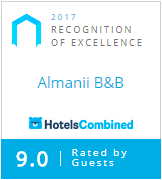 At the Almanii B&B, Dublin City, you are guaranteed a warm welcome, exceptional service, quality food and accommodation to high standards. We are renowned for our friendliness & hospitality and if you want to escape the hustle and bustle of the city centre at the end of the day, without being too far away, our cosy and comfortable rooms will help you to unwind. Enjoy our hearty, home cooked breakfasts the next morning, We hope to make your trip to Ireland and Dublin extra special. We are superbly located between Dublin City and Dublin Airport. An excellent bus service operates by the B&B servicing the city and airport every few minutes. Access to both are therefore frequent,easy to use and only minutes away. Private secure car parking is available for our guests free of charge. We are ideally located for further travel in Ireland located within easy reach of M1/M50 motorways. There are plenty of good traditional Dublin pubs and restaurants all within walking distance for you to enjoy. Omni shopping centre provides a wide variety of shops/restaurants and cinema 5 minutes away. For the sporting fans CROKE PARK stadium is just 5 mins away. Dublin City University (DCU), The Helix, Morton Stadium, Beaumont Hospital are all close by.